Goat cheese and greens stuffed chicken is the kind of dinner I can make by foraging in my refrigerator and yet it seems like I am serving something so fancy on a weeknight. To my children. Ha! This recipe sounds fancy – but it is SO easy – and loved by kids and adults. If this recipe makes you go out and find some local goat cheese, my work here is done. If you want to hit your favorite local grocery store and pick up your favorite soft, herbed cheese (like Boursin), go right ahead. However, if you can’t do regular dairy, I urge you to check out goat cheese – a lot of people who can’t tolerate other cheeses, tolerate goat cheese really well. We are lucky here in North Carolina to have A LOT of goats roaming around some local farms, making some pretty amazing cheese. I try to keep my fridge stocked with goat cheese at all times and, once in awhile, if I get too much goat cheese, I need to freeze some for later. Goat cheese freezes! The cheese … My freezer supply of goat cheese is generally what I use for this goat cheese and greens stuffed chicken recipe. You only need about 1 to 2 tablespoons of goat cheese for each stuffed chicken roll-up so even if I’ve only set aside a small amount, I’m fine for this recipe. The meat … If you have chicken breasts or chicken cutlets you can use either. My dad was my introduction to shopping the sales and keeping a well stocked freezer. When he saw chicken on sale, he would stock up, come home and rewrap the chicken breasts or cutlets into smaller portions double wrapped in plastic wrap and then put in freezer bags and dated. As he left for work, he could take out one chicken breast if he just needed one breast for a soup, or he would take out a 2 or 3 breasts if he was serving chicken as the main course. Just say no to food waste! Repackaging meat to best suit your own family is such an easy way to make sure you are cooking exactly what you need. For this recipe, I use one chicken cutlet for each person although the littlest eaters only ate half a piece of stuffed chicken and Brian and I probably could have eaten two! The second meat that puts this meal OVER THE TOP is prosciutto. If I have made an impulse buy purchase of prosciutto at the deli, this recipe almost always floats to the top of my must-make list. 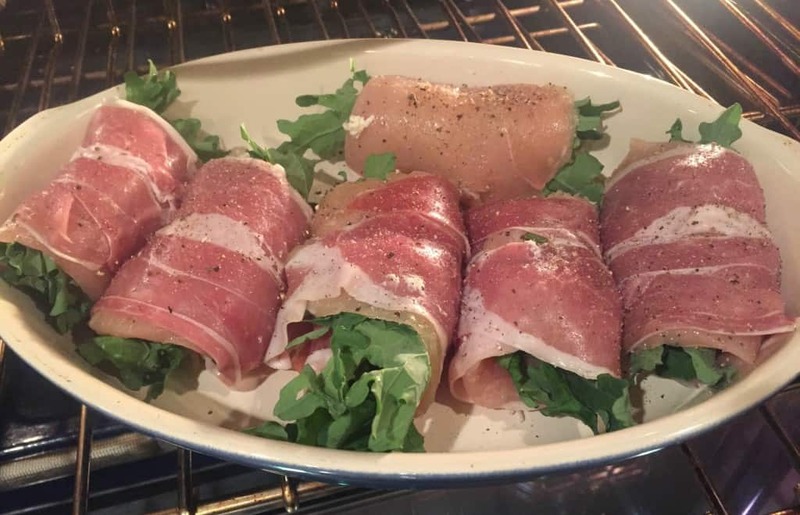 If I need to run to the store to get prosciutto, I either buy it pre-sliced/pre-packaged OR I just ask the deli to slice me six slices of prosciutto (one slice per goat cheese and greens stuffed chicken cutlet). Prosciutto is expensive per pound but six slices of prosciutto weigh next to nothing – this ingredient won’t break the bank. If you have thinly sliced ham on hand, you can substitute ham for prosciutto. Putting it all together … Four ingredients. 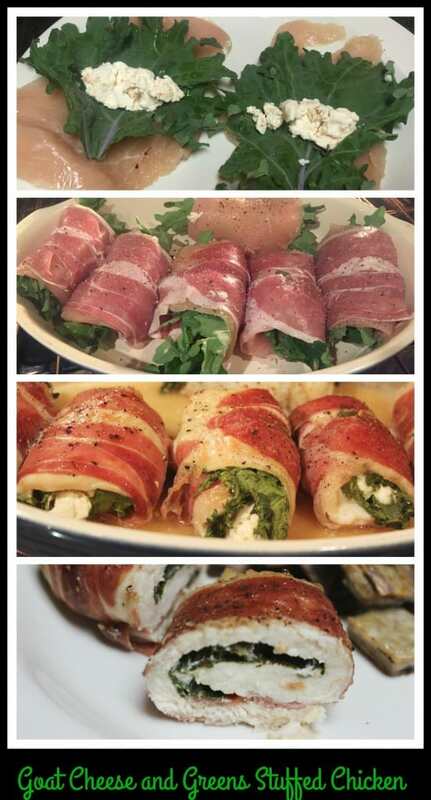 That’s all you need to wow your family with this tasty dinner masterpiece. Because the chicken breasts are split and pounded out a bit or (preferably) you are using cutlets, this meal doesn’t even take very long to cook in the oven, either. I like to serve our goat cheese and greens stuffed chicken with a fresh greens salad on the side or just fruit and roasted potatoes. Enjoy! Four ingredients is all it takes to make this delicious weeknight main course! Take 3 chicken breasts and split them in half. Lightly pound so the breasts are thin. Or, use cutlets! Lay chicken cutlet flat on a piece of prosciutto, salt and pepper the side facing you. Arrange 1/2 of a large green leaf over the chicken cutlet or a few pieces of baby spinach or arugula. Drop one large tablespoon of goat cheese in the middle of each chicken cutlet, on the greens. 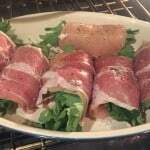 Roll the cutlet gently and secure with a toothpick if necessary - prosciutto is the outer layer, then chicken, then greens, then goat cheese. Place on a baking sheet lined with foil. Season with a little coarse sea salt and freshly ground pepper. Cook at 375 degrees for about 20 minutes. The internal temperature of the chicken should be 165 degrees - a little tricky to check with cutlets - I usually just take it out and cut one in half! Serve with a fresh greens salad or fruit and roasted potatoes. I’m totally digging this dish! What fabulous flavors! Thanks, Kimberly! These ingredients really do work well together!! I adore goat cheese–no sell job needed here! 🙂 And I love the idea of this with arugula. After spending some time in Italy last summer I came home wanting to put it in and on everything. Actually, the same is true of prosciutto. I am pinning this for sure! What a great dish! I love goat cheese, and I’ve got a good goat dairy farm here in Phoenix! Also love your dad’s idea of separating portions of meat into smaller portions — so smart! YUM!! Goat cheese, prosciutto and arugula are some of my favorite things!! Prosciutto is my kryptonite. This chicken looks amazing with it! I could eat goat cheese every single day! This looks delicious! You know, I drink goat milk regularly, but I’ve never tried goat cheese! I’m such a weirdo 🙂 Do you think other types of cheeses would work in this recipe? I’d love to try it. Hi Petra! I think goat cheese works well in this because it’s nice and creamy when it’s cooked but I bet a lot of other cheeses would work as well. Let me know if you try something else! This sounds amazing! I am always looking for new chicken recipes! THanks, Rachel! Same here! It’s nice to find an easy way to change up simple chicken. These look AMAZING!! I am ready to try this! THANKS! It’s delicious. I hope you love it. This looks beyond amazing. MMMM. Can’t wait to try it! Thanks! It really is a delicious and easy dinner. This sounds delicious! I’m allergic to chicken, but turkey is always an easy substitute! Thanks for sharing! Thanks, Jordyn! Definitely you can substitute turkey cutlets in for the chicken and it would still be delicious. I am loving this meal. So simple yet mouth watering! Thanks, Lakisha! We love it here, too.